Over the last few months there have been a few releases for the Protectorate and in a drive to catch up I am going to have a look at a few of them now. Feora, The conquering flame is a mounted Warcaster, a mix of resin and metal it was a real joy to assemble although with that much white I don’t look forward to painting any Menoth figures. 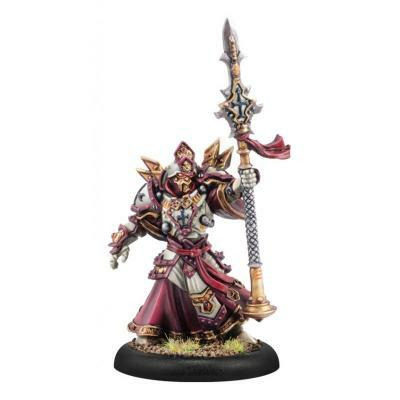 Feora is a great looking warcaster and with a variety of attacks, the most notable being flametrail which will set fire to enemy units in base to base contact, this is a continuous trait although Feoras feat is amazing immediately casting Incite (friendly faction models gain +2 to attack and damage rolls) and all models in Feoras command range gain Flame Trail, which is useful as Feora does seem to have a low focus stat. Sovereign Tristan Durant bends much of his considerable power toward pushing his warjacks to incredible exploits, thanks to spells such as Manifest Destiny and his signature feat, he comes with an extra point of focus as well as an extra Warjack Point, as you can imagine though he isnt mounted so there are a lot less hit points and the stats are in general lower across the board, to counter this Tristan has a reasonable tool set to work with being able to add additional dice to attack and melee (discarding the lowest) could be a game changer, being able to remove D3 damage points every turn from each friendly faction model within his command range is also going to help shore up a game that might be sliding south, his Feat, Prayers of War is probably going to be good for that last minute slam into the enemy lines, all Warjacks in Durants battle group in his control range gain 1 focus whilst Tristan gains an amount equal to the number of warjacks. So hopefully can start reeling of a second set of spells.